Cafe Amici is specified as the websites creator. 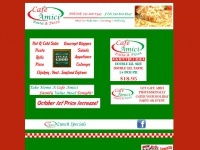 A profile of Cafeamici.net was found on the social network Facebook. The web server with the IP-address 108.179.225.115 used by Cafeamici.net is owned by teensthongs.com and is located in Houston, USA. This web server runs a few other websites, mostly in the english language. The websites of Cafeamici.net are served by a Apache server. The HTML pages were created with the latest standard HTML 5. Both the inclusion of the website in search engines and follwoing of its hyperlinks is explicitly allowed.